His Holiness the 101st Ganden Tripa Jetsun Lungrik Namgyal showed great courage when he left Gaden Monastery in January 2010 to join the monks of Shar Gaden. As the former head of the Gelugpa lineage, and one who is considered an emanation of Tsongkhapa on earth, His Holiness’ decision sent shockwaves through the Tibetan Buddhist world. The Gaden Tripas are the actual supreme authorities over the Gelug School of Buddhism for the last six hundred years. Their authority is supreme. The Gaden Tripas are erudite Scholars and the most advanced senior masters within this school of Buddhism. Their practice, teachings, lineage and authenticity is beyond questioning. It was considered an extremely skilful move on the part of His Holiness Gaden Tripa – he left Ganden after completing his term as the Ganden Tripa (seven years), thereby demonstrating it is possible for many lamas to still be practising Dorje Shugden secretly today. He held his duties perfectly and there was no room for criticism during his tenure as supreme Gaden Tripa. 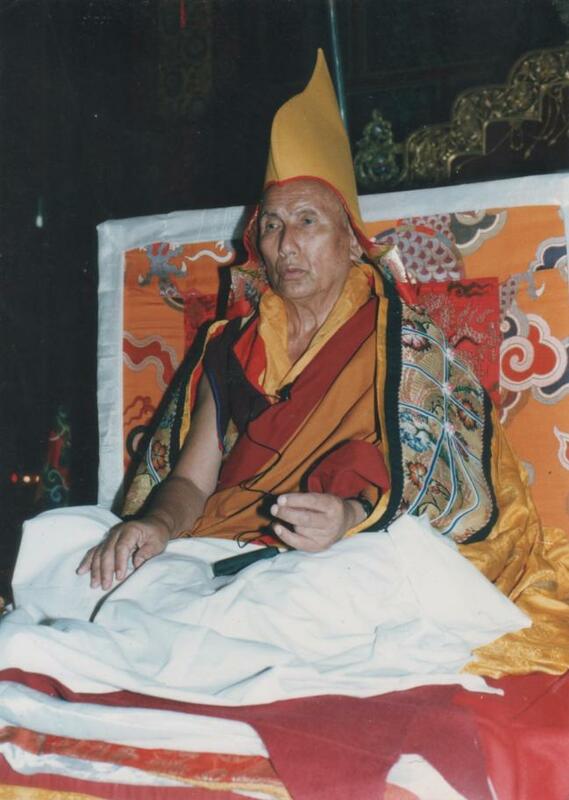 Yet besides being one of the greatest living lamas today, he is also a powerful practitioner of Dorje Shugden. He relies on Dorje Shugden as his principal Dharma protector as he has for most of his life. He shows us the practice of Shugden by the highest lamas only serves to proof further Shugden’s own enlightened nature. For those who continue to force the ban, His Holiness Gaden Tripa was also proof that their ban has not been effective as they have led everyone to believe. 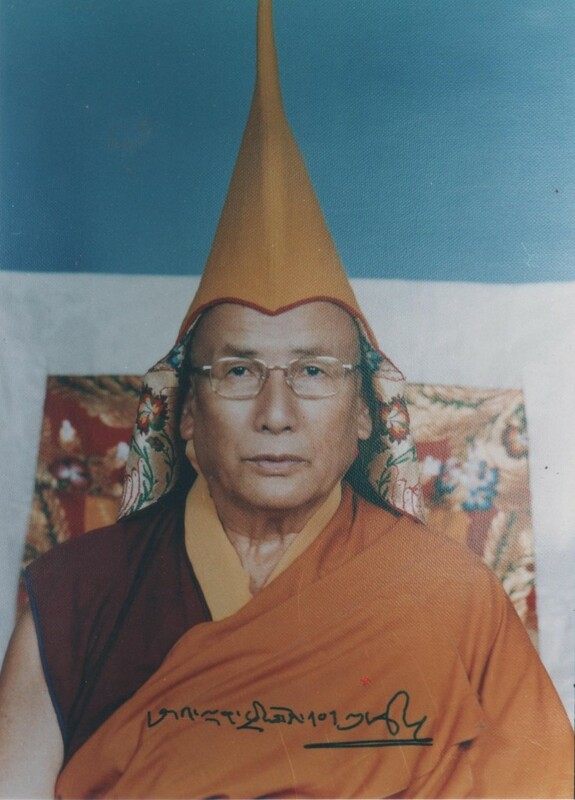 We at dorjeshugden.com wish to thank His Holiness Gaden Tripa Jetsun Lungrik Namgyal for his inspiring example as one of the greatest living lamas who is complete in study, practice and results in standing up for one’s convictions, and the importance of upholding the practice of our gurus no matter the obstacles. May many more masters of his calibre continue to arise. We invite you to read about the life of this great master of our time. This tribute is in continuation of our section here to celebrate great masters who practiced Shugden past and present. We invite to please read a short biography on the incredible and inspiring life of this Dharma King His Holiness Gaden Tripa Jetsun Lungrik Namgyal. His Holiness Gaden Trisur Lungrik Namgyal Rinpoche, the 101st Ganden Tripa, was born in 1927 in the Dawa region of Eastern Tibet. At the age of 8 years old, His Holiness joined the local monastery in Yangding and was consequentialy ordained as a monk. Later His Holiness entered Gaden Shartse Norling College. While a student there Rinpoche studied Pramana Vidya (Logic), Prajnaparamita (Perfection of Wisdom), Madhyamika (Middle Way Philosophy), under the guidance of various highly attained Masters, and also received many precious teachings and empowerments of the pure Ganden lineage. 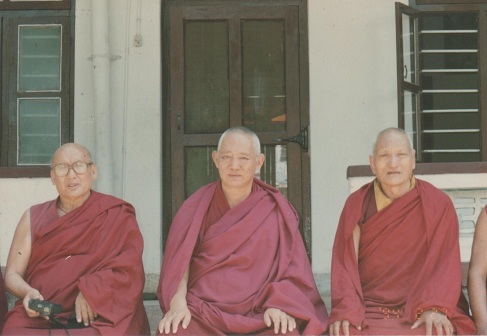 During the Chinese revolution in 1959, Rinpoche escaped to India. Arriving at ‘Ba Se’ along the border of India and Bhutan, he continued his studies and completed the Madhyamika (Middle Way Philosophy), Abhidharma (Treasury of Knowledge), and Vinaya (Spiritual Rules and Moral Law). 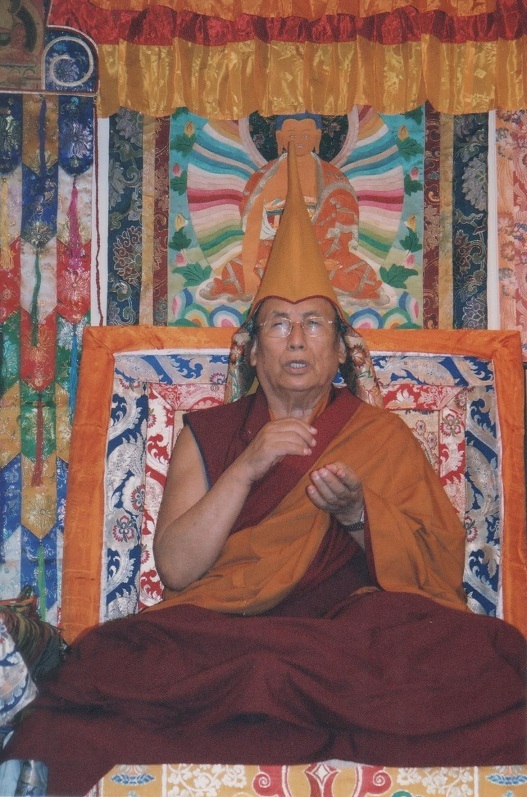 Apart from the normal course of studies, Rinpoche often went for meditation retreats. 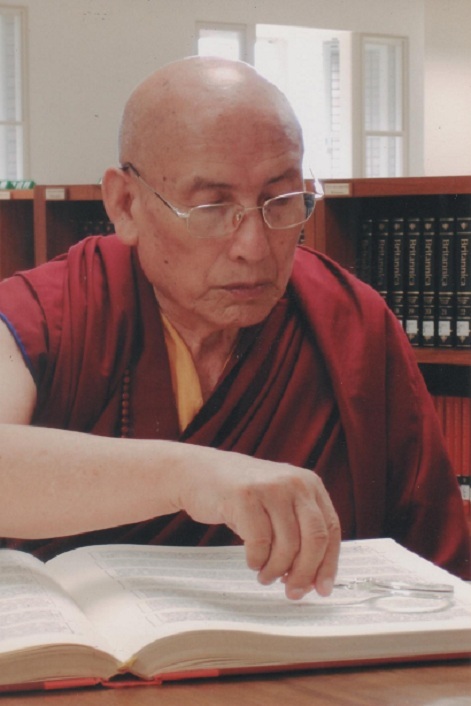 In 1969, Rinpoche revised through the five major treaties of Buddhist philosophy and participated in the final exam at a renowned local Tibetan University, graduating in the 1st position of honor. In 1970, a major debate exam which lasted over a period of 20 days was held. Candidates included over 30 outstanding scholars from the 3 great monasteries and other universities. 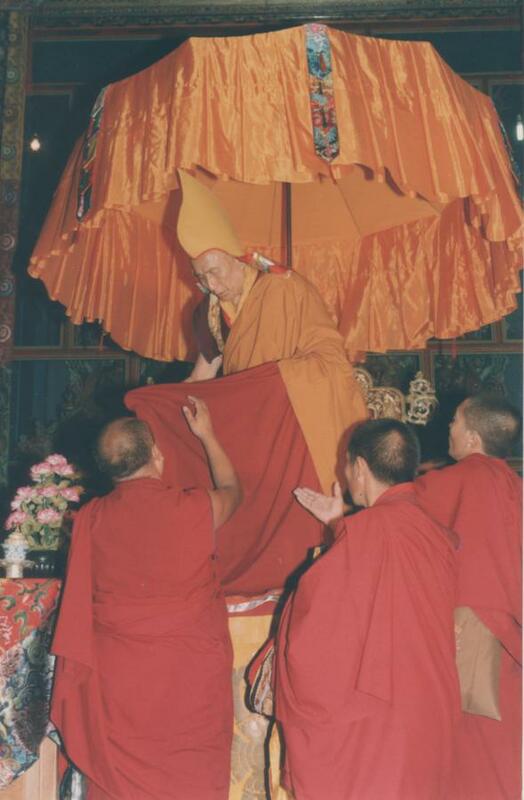 Rinpoche still managed to emerge on top and the title of Geshe Lharampa was officially conferred upon him. Consequently, Rinpoche joined the Gyuto Tantric University and focused on intensive study of the Tantras. In 1983 and 1992, the Dalai Lama appointed Rinpoche as the abbot of Gyuto Tantric University and abbot of Gaden Shartse Norling Monastery respectively. 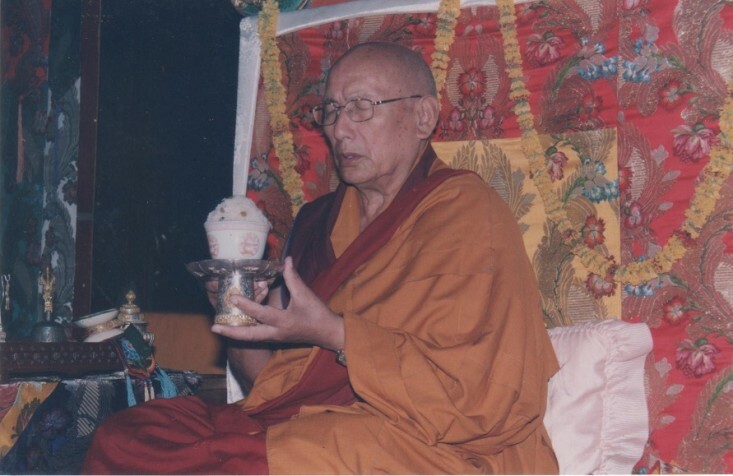 During the years of Rinpoche’s abbotship, apart from supervising the administration and discipline of the Sangha, he also conducted various pujas and teachings personally. 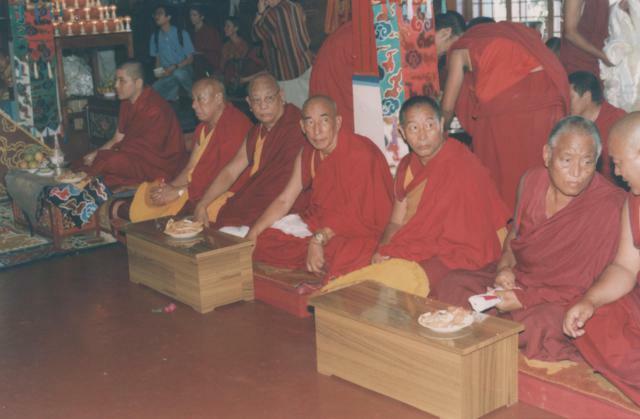 Rinpoche’s contribution towards the monastery is widely recognised, and deeply respected by all. 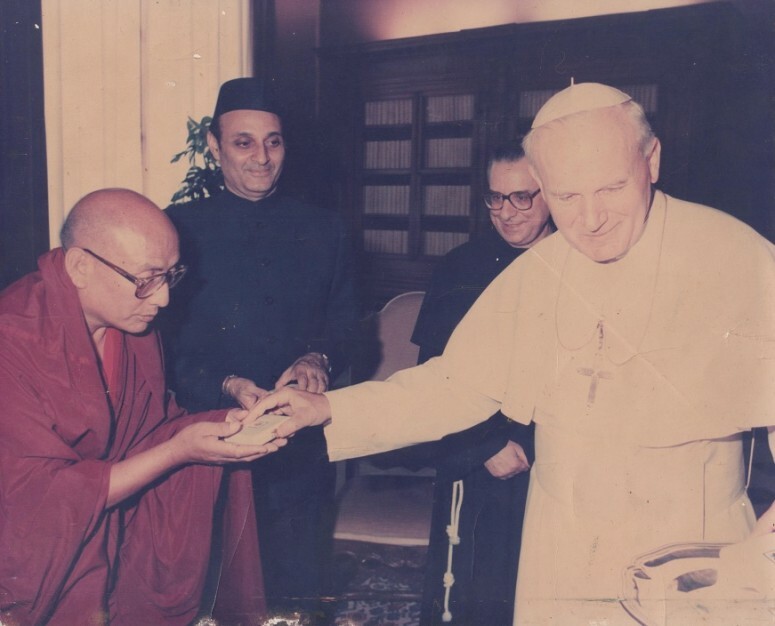 In 1986, these remarkable qualities inspired the Dalai Lama to choose him as the representative of Buddhism in Ecumenical Encounters of Assisi interfaith meetings convened on the initiative of Pope John Paul II in Italy. 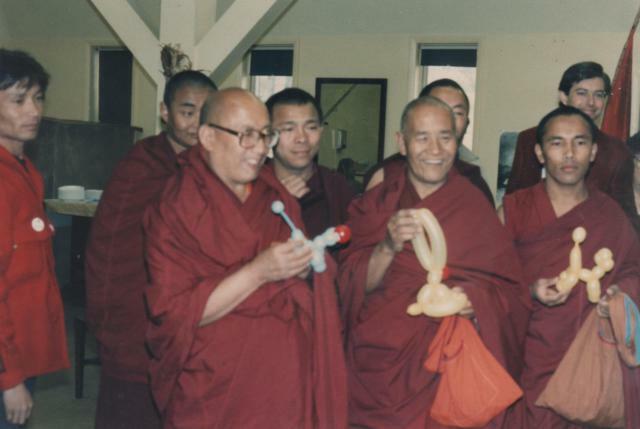 In 1995, Rinpoche was bestowed the honorary rank of Shartse Choje (2nd rank among dignitaries of the Gelug tradition). 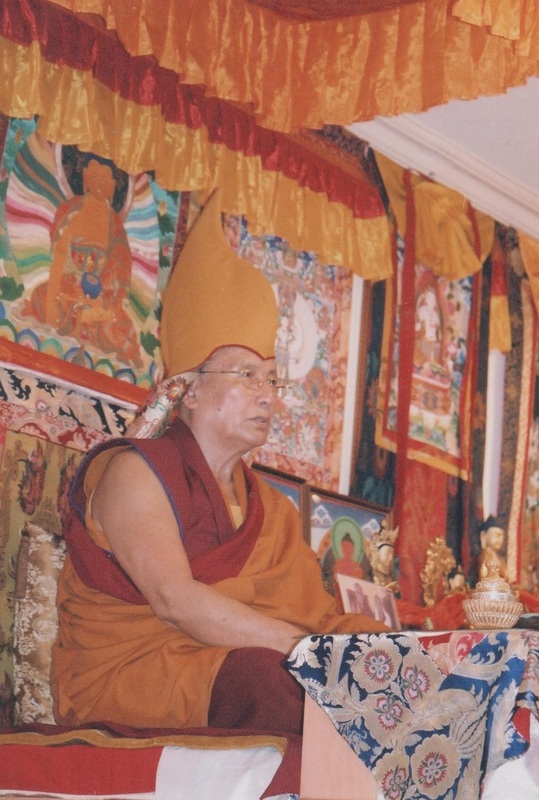 After 6 years in that position, on January 20, 2003, the Dalai Lama, during his Kalachakra Empowerment in Bodhgaya, announced the appointment of Venerable Lungrik Namgyal as the 101 Gaden Tripa – the supreme head of the Gelug tradition, and literally, the Holder of the Throne of Tushita. Rinpoche is one of the most qualified Buddhist teachers alive today – being highly trained in both fields of Sutra and Tantra. Rinpoche has dedicated his whole lifetime to the propagation of the Buddhadharma, and has been tirelessly visiting many parts of the world to spread the Teachings. 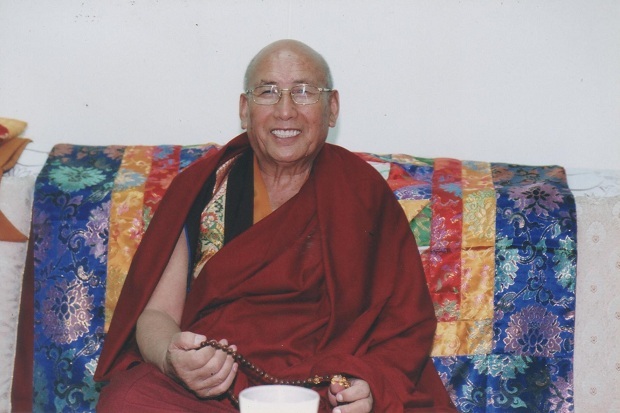 Countries which Rinpoche has visited include – France, Spain, Switzerland, Italy, America, China, and Singapore. His Holiness Trisur Rinpoche currently lives in Paris, where he transmits precious Buddhist teachings of his lineage in Thar Due Ling Dharma center in Chelles, France which he founded in 1980. 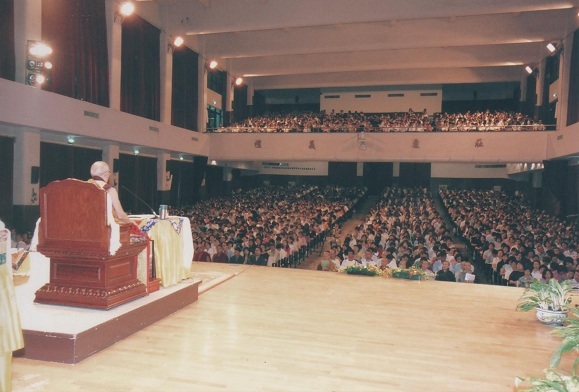 A regular sight at His Holiness’ teachings, which see packed auditoriums and halls waiting to receive his blessings and wisdom. 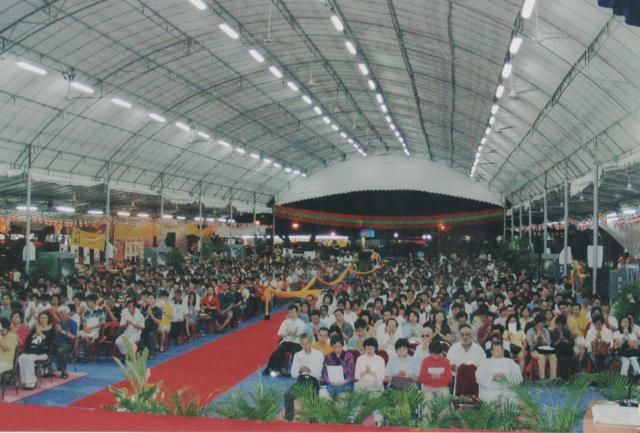 This photograph was taken in Taiwan, where 30,000 to 40,000 people attend His Holiness’ teachings. 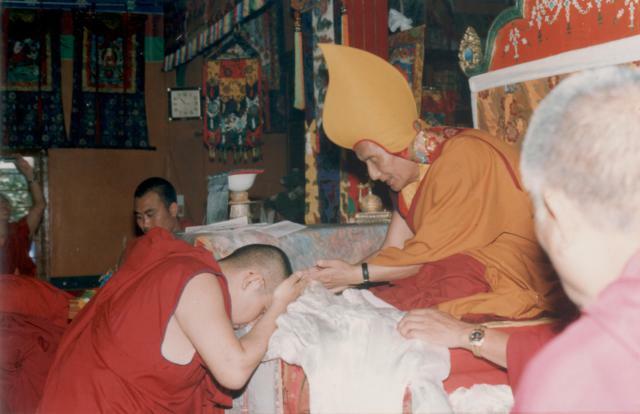 His Eminence Khensur Jampa Yeshe offering a khata to His Holiness Ganden Tripa Lungrik Namgyal Rinpoche during a ceremony shortly after taking the throne as Gaden Tripa (2003). His Holiness Ganden Trisur Rinpoche Lungrik Namgyal, His Eminence Kyabje Zemey Rinpoche, His Eminence Geshe Tendar Rinpoche. 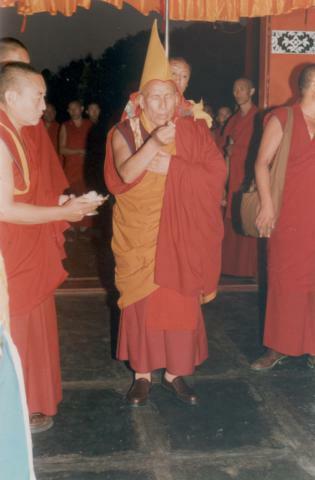 His Holiness Trisur Rinpoche shortly after becoming the Ganden Tripa of the Gelug lineage. 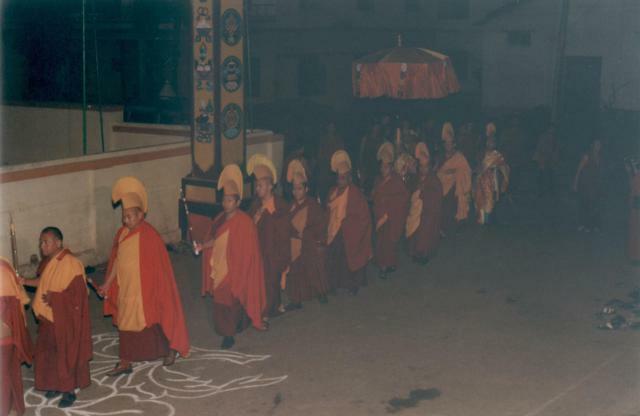 Procession of abbots from all of the major Gelug monasteries following the enthronement of Ganden Tripa Lungrik Namgyal Rinpoche. 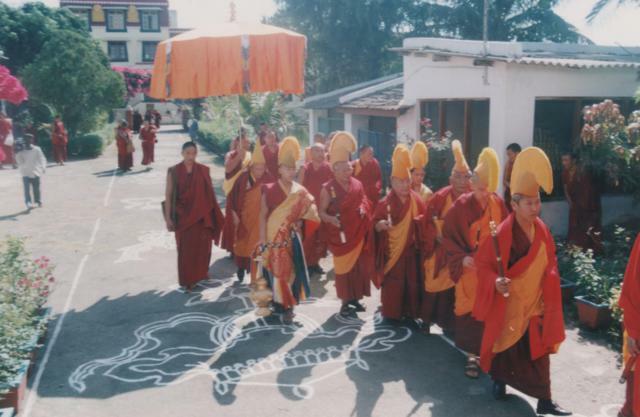 His Holiness Lungrik Namgyal entering Gaden Lachi for the first time as Gaden Tripa. 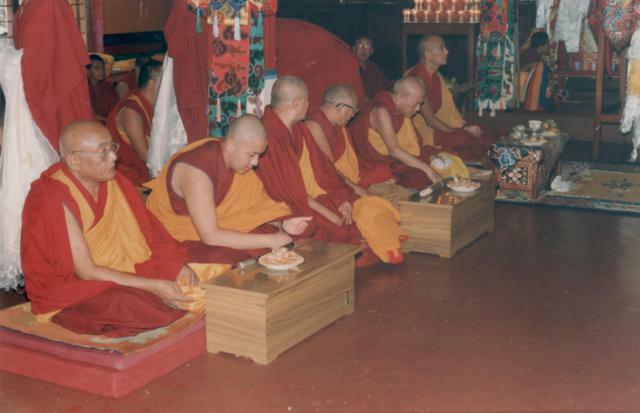 His Holiness Kyabje Ling Choktrul Rinpoche, His Holiness Kyabje Lati Rinpoche, His Holiness Sharpa Choeje; with the abbots of Sera Mey, Sera Jey, Rato, Tashi Lhunpo, conducting a long-life puja in honor of His Holiness Ganden Tripa Rinpoche. 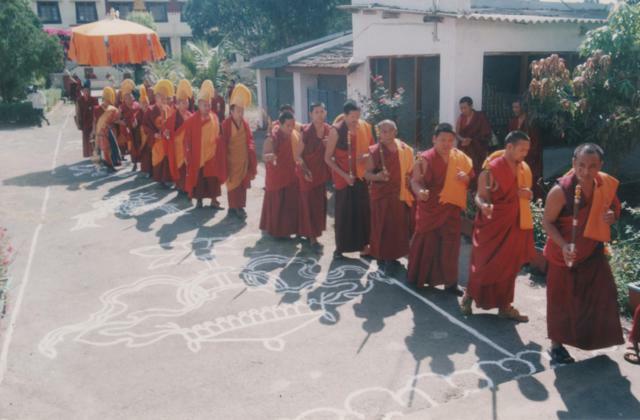 His Holiness the Ganden Tripa being escorted into the hall to a long-life puja being conducted in his honour. Awaiting the start of the long-life puja ceremony. 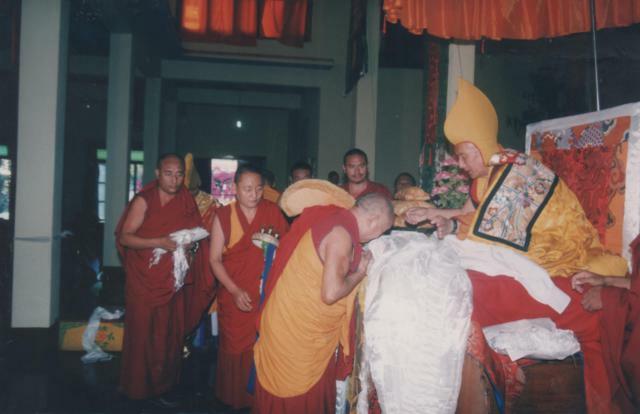 Abbot and disciplinarian of Gaden Shartse making offerings to His Holiness Ganden Tripa Rinpoche. 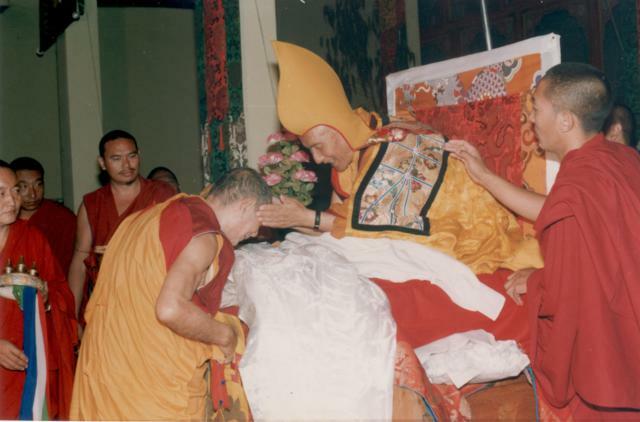 From left to right: His Eminence Kyabje Lati Rinpoche, the then-abbot of Gaden Geshe Mara, His Eminence Khensur Konchok Tsering, and His Holiness Zong Choktrul Rinpoche offering a long-life puja to His Holiness Ganden Tripa Rinpoche. 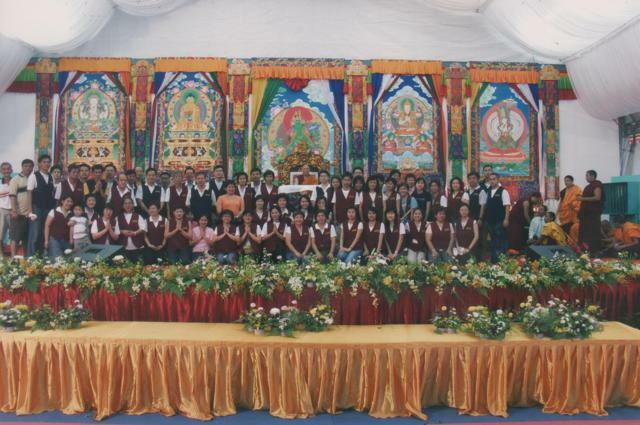 His Holiness Lungrik Namgyal Rinpoche in America during his tenure as abbot of Gyuto Monastic University. 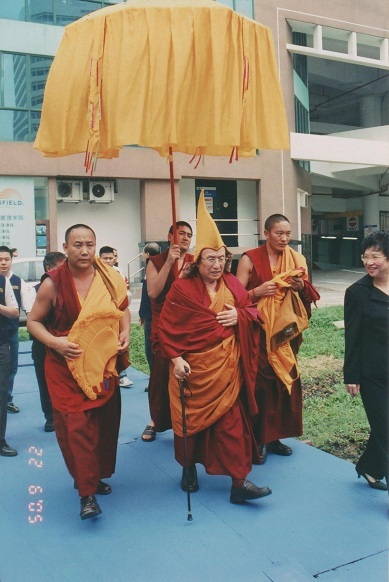 His Holiness Ganden Tripa Rinpoche attending a Dharma event in Singapore. The Gelug lineage was the last tradition to be formed within Tibetan Buddhism. It emerged as the pre-eminent Buddhist school in Tibet since the end of the 16th century. Lama Je Tsongkhapa is the founder of the Gelug tradition. Lama Je Tsongkhapa was born in Tibet during a degenerating age in Buddhism (end of 14th and beginning of the 15th century) – discipline of the monks was weak and there was a general misunderstanding of the Dharma. Lama Tsongkhapa took on a revolutionary role and restored the Dharma to its original purity, with specific emphasis on monastic discipline whereupon he corrected prevalent monks’ behavior of pursuing power and riches. Lama Tsongkhapa brought about an impactful reformation in Buddhism at that time. He promoted strict monastic discipline as the ideal basis for religious education and practice, and established monastic universities which offered strong education and spiritual training to monks. His reformation was very meaningful and was very quickly and widely accepted by people at all levels. Of the major monasteries in Tibet, Ganden Monastery (further divided into the two colleges of Ganden Shartse and Jangtse, and recently Shar Ganden) was founded by Lama Tsongkhapa himself in 1409. 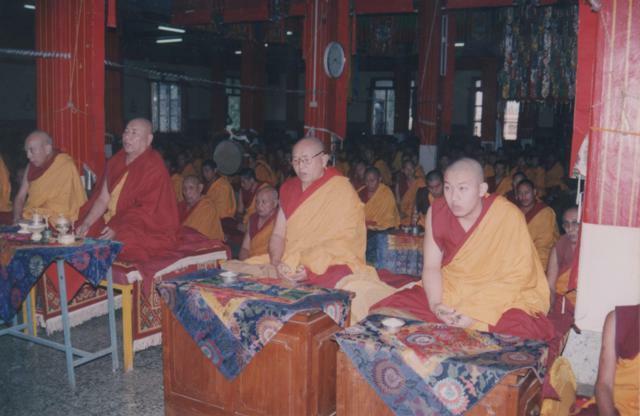 The Gelug tradition advocates a solid grounding of academic study and celibate monastic discipline. Lama Tsongkhapa established sound scholarship as a prerequisite for constructive meditation; hence, the teachings of both Sutra and Tantra are subject to rigorous analysis through the medium of dialectical debate. At that time, the Gelug lineage was spreading far and wide, reaching not only Tibetan communities but also to neighboring regions, and has been flourishing ever since. 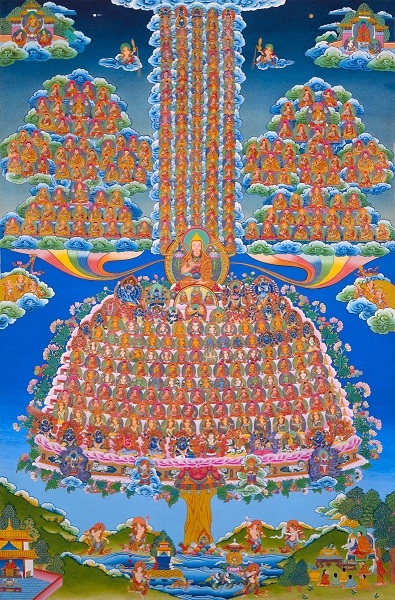 The Ganden Tripa is the Throne Holder to the seat of Lama Je Tsongkhapa and is the Spiritual Head of the Gelug order. 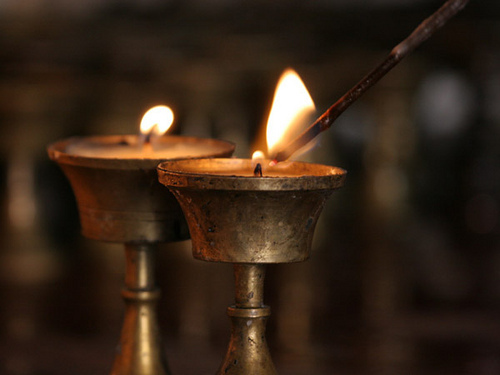 The role of the Ganden Tripa is to continue the propigation of the pure teachings of Lord Buddha Shakyamuni, as well as promoting Tibetan Buddhism- especially the lineage of Lama Je Tsongkhapa, all over the world. NOTE: All of the information above has been extracted from His Holiness the Ganden Trisur’s website http://www.trisurlungriknamgyal.com/. We have made this information available on dorjeshugden.com so that more people may make a connection with this incomparable master of Lama Tsongkhapa’s tradition. This entry was posted on Thursday, February 23rd, 2012 at 9:51 am	and is filed under Tributes. You can follow any responses to this entry through the RSS 2.0 feed. You can leave a response, or trackback from your own site. submit to the other sites like Metacafe, Dailymotion and Flickr. items and such other stuffs.